On April 30 Google updated the PageRank showing us your toolbar. This is the second update of 2008. The next update is expected in late September. PageRank is the algorithm that Google uses to give a numerical value to the importance of a web page. This value is used as part of the algorithm that sets the order in which search results are displayed on Google. The PageRank is named in honor of its creator Larry Page. PageRank does not mean "ranking of pages". Over the years Google has been modified this algorithm in order to neutralize some traps made by webmasters who wish to modify their position fraudulently. In this latest update it seems to have also modified the algorithm as numerous websites have lowered their PageRank ... but fortunately, many others have gone up, including some of our customers. The PageRank shows the Google bar only updated once every 4 months or so. The bar shows a PageRank base 10 on a logarithmic scale. That is, it is easy to climb from 0 to 1 or 2 to 3, but instead is very difficult to climb from 5 to 6, and even more up 6 to 7. But this is not the actual PageRank of our website, but value that Google assigned the last time you updated the PageRank bar. 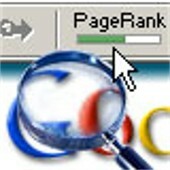 During 2007 there were 3 updates PageRank in the Google bar: in January, April and late September. Forecasts for this year are the same: we waited 3 updates. If all goes well, we should wait for the month of September. So all actions to increase the PageRank we perform from now, will not be reflected in the Google bar until this month. This does not mean that before September, our actions are useless. Nothing is further from reality. Recall that Google works with a PageRank in real time.